Many of today’s workers will lack the resources to retire at traditional ages and maintain their standard of living in retirement. Solving this problem is a major challenge because risk and responsibility have shifted from government and employers to individuals. 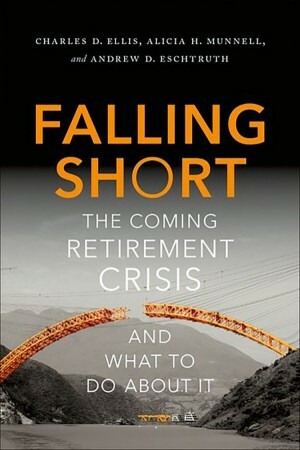 Falling Short provides a vivid picture of the coming retirement crisis and provides specific solutions that are both conceptually simple and eminently feasible because they build on the existing retirement system. This concise guide is grounded in academic research yet written in a highly accessible style for anyone concerned about the future of retirement. Falling Short points the way to solving America’s retirement challenge simply by optimizing our existing systems. Make Social Security solvent, make workplace savings plans fully automatic, lift savings rates and extend savings plans to all workers. What are we waiting for? Let’s do it. I loved this book! It is short, punchy, and highly readable. It provides a full analysis of the grim status of our nation’s retirement savings plans and offers solutions that are realistic and long overdue. I recommend it to all those concerned about America’s retirement problems, including their own. Illuminating the retirement challenge by combining Munnell and Eschtruth’s keen sense of the academic research with the horse sense of famed investment advisor Ellis is a great idea. Read Falling Short; it’s brimming with sound advice. Then pass it along to your brothers and sisters. Many baby boomers are woefully unprepared for retirement. This book proposes both useful actions that individuals can take and institutional changes to 401(k)s and Social Security. This gem of a book makes an important contribution to alleviate a pressing social problem. America’s retirement savings system has failed. Too many people are retiring with too little to live on. This excellent book nails the changes and incentives needed to restore an aging generation to fiscal health. Every voter and policymaker should read it.